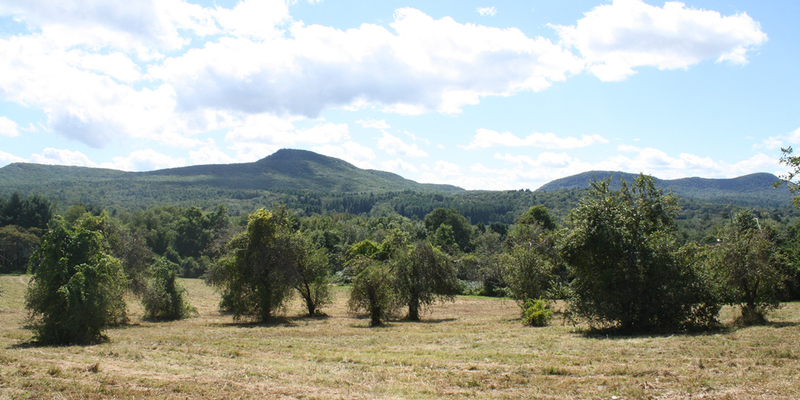 In November 2018, a team of UMass students were given an unusual assignment for a class: Go take a hike. The five undergrads from professor Lena Fletcher’s “Environment & Society” course — Julie Ehrlich, John D’Alessandro, Zachary Peck, Matthew Tran, and Haley Vaitses — visited two conservation areas in Amherst and shared their experience with exploring these places for the first time.  Their first visit was to the Wentworth Farm Conservation Area. 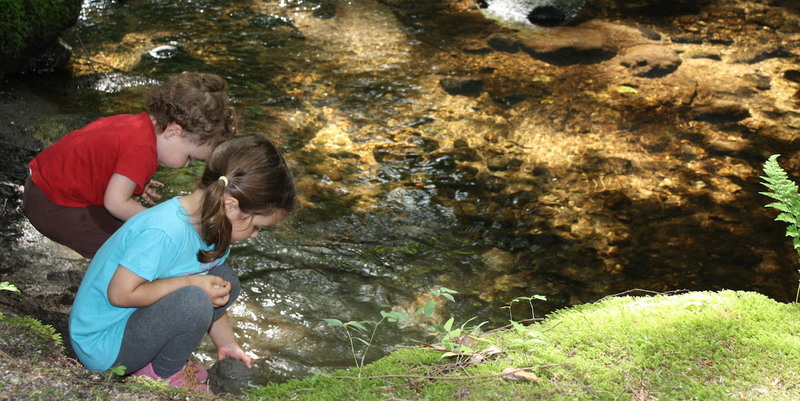 Their second visit was to the Lawrence Swamp Conservation Area. Here are their stories, along with Julie’s beautiful photos. Increasingly wet weather trends in the Northeast brought us nearly record-breaking amounts rain in our region in 2018. 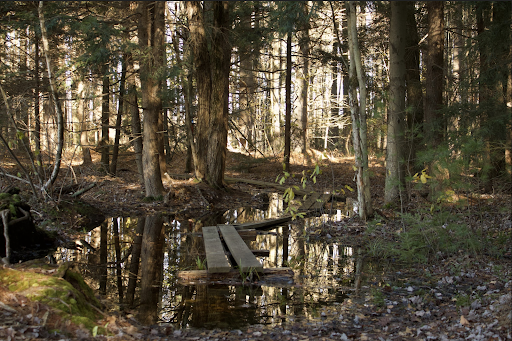 Even in the late fall, Lawrence Swamp was cresting beyond its seasonal levels, transforming the wooded trails into small canals. 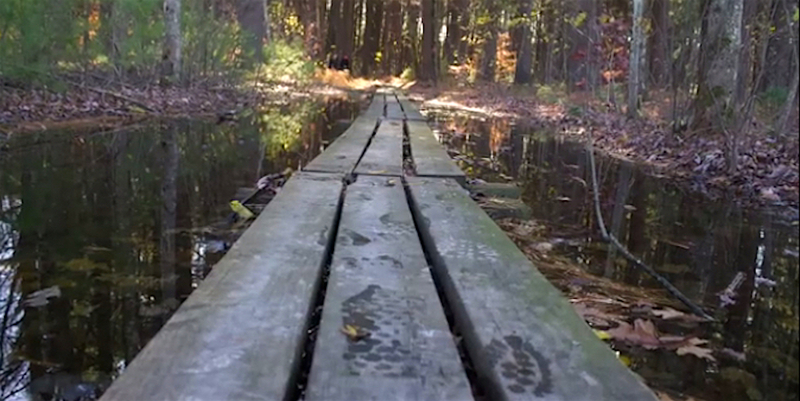 The students got more swamp than they bargained for, and their wry descriptions bear witness to the effects of climate change on vulnerable trails in the Pioneer Valley. You can see more of their story in this video as well. Lawrence Swamp truly is swampy. During a rainy season, be prepared with high waterproof boots to brave the trail. Although the scenery is beautiful, and we are told it’s a very interesting trail with several fun landmarks, we did hit a few hiccups when trying to access the Robert Frost Trail. No sooner had we stepped off the road and into the Lawrence swamp, then the water was swarming over our shoes. In some places, the ground appeared solid, only to sink under our feet; in others the trail was completely filled with water, forcing us to walk on the banks alongside. Intermittently we came across constructed planks which could be used to cross, however, many of the boards were underwater, or were ready to sink as soon as weight was applied to them. In my opinion this only added to the fun and intensity of the hike; it encouraged us instead to find or make our own bridges, to jump from solid ground to islands or back. However, it is something to consider if your plan involves people who are not able-bodied, young children, or dogs that you don’t want to go swimming. 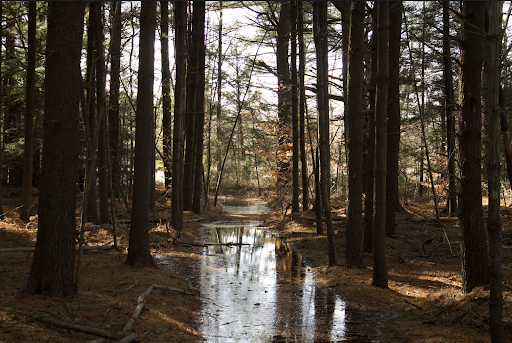 The deeper we entered the woods, the more water we saw. Fortunately, there were makeshift planks to walk on to avoid the small pools of water. However, as we went farther, we saw fewer of the makeshift planks. Some were submerged completely under water. 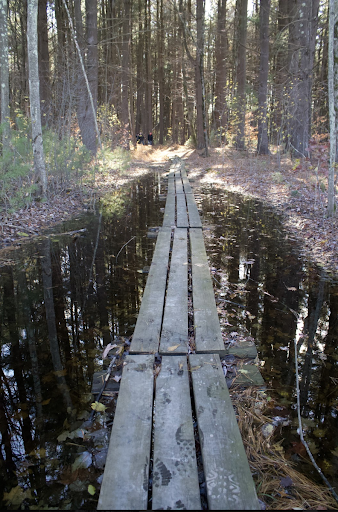 We had to make our own bridges to avoid succumbing to the swamp, and about halfway into the trail, we had to turn back around because the waters completely covered the pathway and were too deep for us to walk through. There was something special about the silent and still woodland that I found extremely peaceful, a place to escape the drama and noise of our everyday lives if only for a couple hours at a time. My experience at Lawrence Swamp was enlightening of the work put into these conserved trails; the only thing I’d do differently next time is wear some more appropriate footwear for such a soggy wetland. If you are a person who doesn’t mind going off trail and creating your own little adventure, then this is the place for you. The trail is absolutely gorgeous to photograph, but due to the swamp I would suggest leaving your DSLR at home and just use your phone for any pictures.